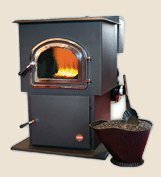 The "Allegheny" is a contemporary fully automatic and variable control stoker stove. The patented "Allegheny" efficiency stoker system is easy to use, reliable and constructed to exacting standards. Enjoy the cozy comfort of our steady burn coal stove. This high quality stove with its secondary burn system for high efficiency and internal plenum heat is ideal for heating a country cottage, your home or condominium. Wake each morning to the pleasing warmth of the "Allegheny". Long Back "Tip Proof Base"